FRIDAY, Oct. 17 (Health.com) — The U.S. Food and Drug Administration (FDA) announced Thursday that it has updated the label for the psoriasis drug Raptiva to reflect the fact that the drug may increase the risk of life-threatening opportunistic infections. Known as a boxed warning, the new label notes that Raptiva (efalizumab) can increase the risk of bacterial sepsis, an infection of the bloodstream; viral meningitis, which affects the brain; invasive fungal infections, which can damage the lungs or other areas of the body; and a condition known as progressive multifocal leukoencephalopathy (PML), a viral infection of the brain. 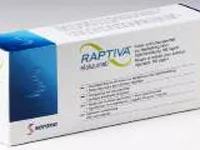 Several people taking Raptiva have been hospitalized and some have died due to these infections, according to the FDA. The symptoms of PML include confusion, dizziness, vision problems, or difficulty talking or walking, the federal agency said. Other signs that require immediate medical attention include dizziness or weakness; abnormal bruising or bleeding gums; numbness or weakness in the arms, legs, or face; or worsening of psoriasis or arthritis. In addition, animal studies have suggested that the drug may cause permanent suppression of the immune system in children. The drug is not approved for use in children under 18. The animal research was conducted in mice equivalent to ages 1 to 14 in humans. The drug, administered as a once-a-week injection, was approved in 2003 and treats psoriasis by suppressing the immune system. Patients should receive all their vaccinations before starting treatment and they should not be given vaccines during treatment. Raptiva is approved to treat moderate to severe plaque psoriasis in adults who would otherwise be candidates for phototherapy or systemic therapy. "As part of FDA's monitoring of the life cycle of approved products, the agency received reports of serious infections in some patients taking Raptiva. These reports led to our decision to highlight these risks in the drug's labeling," said Janet Woodcock, the FDA's director of the Center for Drug Evaluation and Research, in a statement. "Doctors and other prescribers should carefully evaluate and weigh the risk/benefit profile of Raptiva for patients who would be more susceptible to these risks."